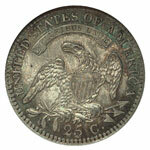 Until the 1850s the quarter dollar was something of an orphan denomination among United States coins. The prevalence in circulation of the Spanish two-reales piece made minting of its federal counterpart largely unnecessary. Since the Spanish coins remained legal tender until 1857, it wasn't until that decade that the United States Mint made a serious effort to displace these popular and familiar foreign pieces. 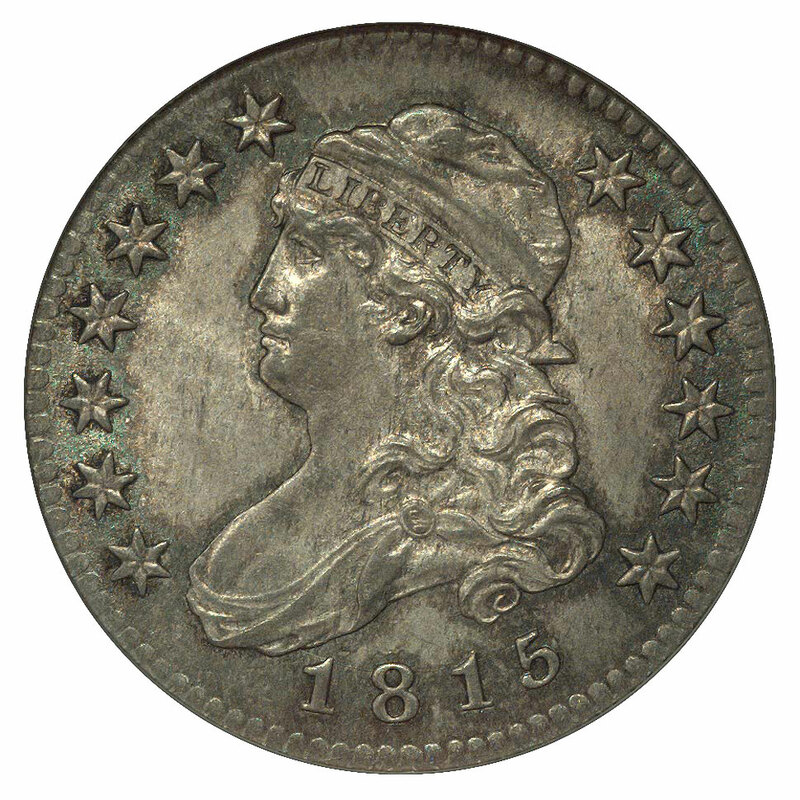 John Reich introduced a new Capped Bust of Liberty on the half dollar in 1807, and it was ultimately adapted to all of the current silver denominations. The quarter dollar, coining of which had been interrupted previously from 1797 through 1803, was not needed again until 1815. Beginning that year, large size Capped Bust quarters were coined somewhat irregularly through 1828, with none dated 1816, 1817 or 1826. The coins of 1823, 1824 and 1825 are all overdate varieties, while the 1827 issue was struck only as proofs. Minting of this denomination ceased entirely during 1829 and 1830. 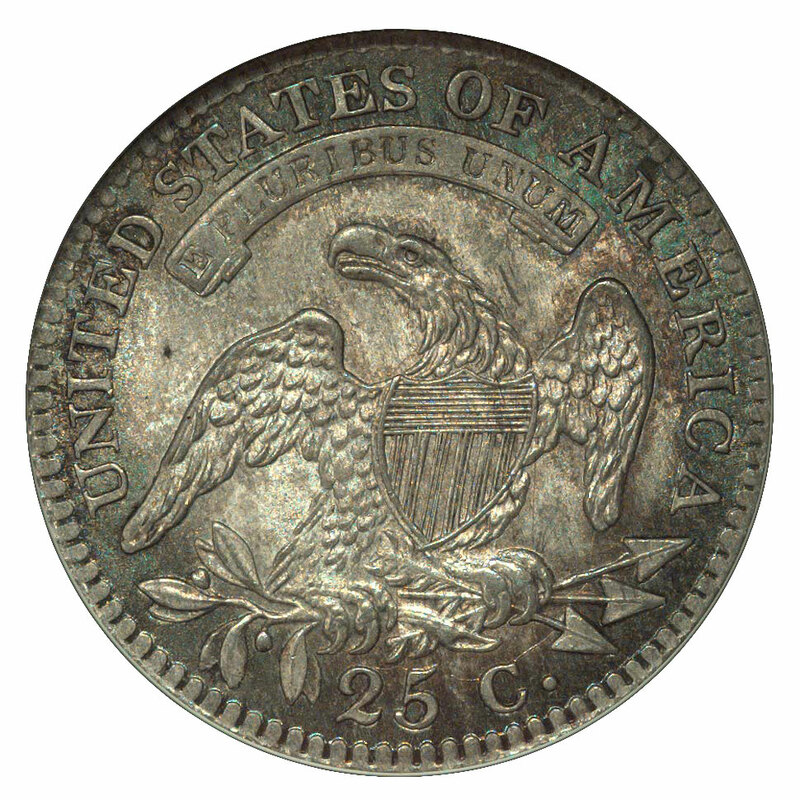 When quarters were again struck in 1831, it was with William Kneass' interpretation of the Reich design, which featured modified devices and a reduced diameter. The highest mintage for any date occurred during 1818, when 361,174 quarter dollars were coined. Most annual figures fell far short of this number, accounting for the general scarcity of these coins. 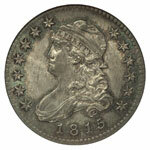 Mint state examples are genuinely scarce, with the high-mintage date of 1818 being the most available issue. Gems of any date, however, are quite rare. Few of the surviving mint state pieces have their original surfaces. The majority have been either dipped or lightly cleaned at one time, though a number have since retoned to varying degrees of attractiveness. Contact marks are usually not much of a problem with these coins, though their shallow borders exposed the higher points of relief to friction. Often seen are fine, hairline scratches that can keep a coin from attaining choice or gem status. These hairlines are sometimes also the result of careless cleaning. The same comments that apply to mint state quarters of this type are largely true for circulated pieces, as well. Most survivors have been cleaned at one time or another. Such cleaning may have occurred generations ago, and coins so treated typically acquire a new layer of toning. While some examples acquire attractive, natural toning, too often seen are coins having blotchy or unnaturally colorful toning. It's been my experience that most collectors cannot tell the difference between totally original toning and second generation toning that is natural in appearance. For practical purposes, such coins are usually described as being "original," and this seems satisfactory within the current market. Grading services likewise will accept these coins for certification in many instances. Though weak striking is not a serious problem with this coin type, at or near the mint state level some weakness may be detected. The Official American Numismatic Association Grading Standards for United States Coins identifies these areas as "the curl on the neck, in the clasp, hair, and on the motto above the neck." Aside from this consideration, grading large size Capped Bust quarter dollars in circulated grades is fairly simple using the text and photos found in that book. The rarity of this series is greatly under appreciated by collectors, who tend to favor date runs that have fewer interruptions. With just a few exceptions, most issues in this series are very scarce in original, problem-free condition, irrespective of grade. The mint state examples I see are usually disappointing in overall quality, especially when compared to the abundant half dollars of this type. They are typically bright white from a recent dipping or have deep toning over very subdued luster. Choice circulated pieces are also very desirable when found in original condition.